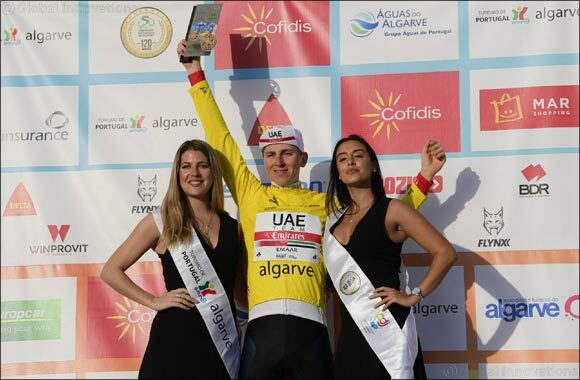 Dubai, United Arab Emirates - February 25, 2019: UAE Team Emirates’ young Slovenian talent Tadej Pogacar shone as brightly as the Portuguese sunshine yesterday, closing out the five day Tour of the Algarve by winning the General Classification (GC) in the team’s first stage race win of the season. Still wearing the yellow leader’s jersey that he earned on stage two, Pogacar battled hard fighting off the continued attacks of his GC rivals over a 173.5km course that ended with a 3km climb into Malhao. The 20-year-old rising star finished sixth in the final stage, just 18 seconds behind Zdenek Stybar (Deceuninck-Quick Step) and 15 seconds from his most dangerous rival Søren Kragh Andersen (Sunweb). His consistency throughout the race, along with the support provided by his team mates, allowed Pogacar to keep a 14 second gap on Kragh Andersen and take the top podium spot above the Danish rider and Wout Poels (Team Sky), who finished third, 21 seconds behind the eventual winner. Commenting on his first stage race win on the WorldTour, Pogacar said: “I knew that it would be a difficult day, the stage was raced at high speeds and my direct rivals launched attacks for the overall. I had great support from all of my team-mates, who worked at the front to the group to give 100%. When the attacks started, I saw that I had fresh helpers at my side, this was a big morale boost in addition to a big concrete advantage. I’m proud of all of my team-mates. The result will be yet another boost for UAE Team Emirates who have now taken six stage wins as well as the General Classification win on the professional road racing circuit. These achievements are in addition to the Emirati National Time Trial Championship earned by Yousif Mirza on Saturday.